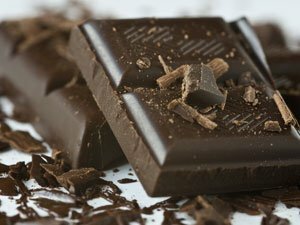 British chemists have found a new way to halve the fat of chocolate using liquids which does not change the “mouthfeel”. British researchers at University of Warwick said water, fruit juice or even alcohol could replace up to half the fat. Dr. Stefan Bon said that the smooth texture of chocolate requires that the globules be smaller than about 30 millionths of a metre across – about half the width of a human hair. That formulation made “armored” spheres of liquid, using two materials – fumed silica, a form of the same material from which sand is made, and chitosan, a compound derived from shellfish. “That was exciting because it had the combination of fruit juice and chocolate, and everybody went wild on it,” said Dr. Stefan Bon. “So you can stick to your fruit juice if you want, but you can also make a vodka-based chocolate bar, which is exciting – obviously not very healthy, but exciting,” Dr. Stefan Bon said. On a healthier note, Stefan Bon added that using the method with other liquids could lead to significantly reduced sugar content as well. Who was Margaret Thatcher? Her biography at-a-glance.